Shiite militias withdrew from police stations in three cities as the cease-fire held in Fallujah. BAGHDAD, Iraq  As a tenuous cease-fire held Monday in the restive Sunni city of Fallujah, a radical Shiite cleric pulled his militiamen out of police stations in three southern cities in an attempt to ease a standoff with the United States. With quiet on both fronts, the scale of Iraqs worst fighting since the fall of Saddam Hussein became clearer: The military reported about 70 coalition troops and 700 Iraqi insurgents killed so far this month. It was the biggest loss of life on both sides since the end of major combat a year ago. Sophomore ballet and modern dance major Allison Ploor and sophomore English and ballet major Michelle Timmons walk to their French class. 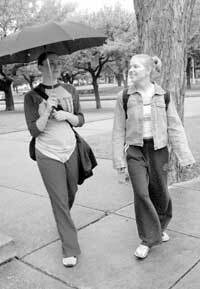 As the weather changed this weekend, students had to go from shorts to sweats to accommodate for the rain. The lingering economic recession has affected all parts of the economy and the job market has taken an especially hard hit. Jazz music mingled into Moudy Building South Monday evening along with a large crowd of students and guests who came to hear David Bedford, a professor of Spanish and Latin American studies, discuss genres of Latin American literature. Last week National Security Adviser Condoleezza Rice defended the Bush administration before the September 11 Commission. Her testimon y was quickly dissected and digested by the mainstream media. For almost $3,000 a college student could take a Spring Break trip to Hawaii  with a friend. A college student could buy a rather large high-definition plasma TV. Or, this college student could take his or her $3000 and spend it on a four-month stay at one of the luxurious dormitories here at TCU. Even after Neil Dougherty picks up his laundry from the dry cleaners he is never fully satisfied. It may not be volleyball season yet, but that hasnt stopped the Horned Frog volleyball team from competing. Adrienne Brown has sent out more than 40 resumes and been on four job interviews recently. But if she doesn't land a job by the time she graduates from Michigan State University next month, she'll be working as an office assistant at a campus dorm. My editors made me do it!